Having spooked nervy tourists for the past 38 years, today is the last day for the London Dungeon at its Tooley Street address. The various body parts, fake blood and grisly recreations of London murder sites are to be boxed up and shipped to a new location at County Hall. 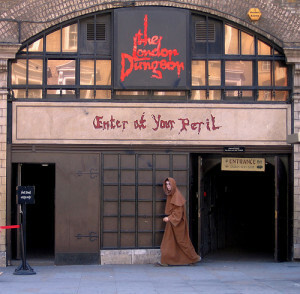 In recent years the Dungeon had suffered from rival attraction the London Bridge Experience, which resulted in a protracted court case resulting in an out-of-court settlement. The bruising skirmish, plus the desire by operator Merlin to put the Dungeon near to its other major South Bank attraction, the London Eye, led to this move. The newly cloistered Dungeon is scheduled to open on 1 March. The Dungeon is having a bit of a clear-out prior to the move, and will hold a sale this Sunday, at Pimlico Car Boot Sale in Lupus Street from 11.30am. According to the Telegraph, items on sale will include "torture and surgical equipment", “severed limbs”, “false eyeballs”, "plague doctor's potions" and "Sweeney Todd razors", amongst other things. Hard-up medical students might want to visit on the off-chance that there are a few genuine skeletons lingering about.